Hi all! Welcome back to day 2 of my Color Coach week! For those of you that are just tuning in, all this week i am going to be showcasing cards/projects that i made where i was inspired for colors by the Color Coach. You can see yesterday's post by clicking HERE. Today's card is a simple card where i left what kind of card it was going to be (meaning birthday, thank you, sympathy, etc.) up in the air. I like having a few cards like that so that i can just grab one and put a greeting on it quick. The colors that i used from the Color Coach were Melon Mambo, Daffodil Delight, and Tempting Turquoise. 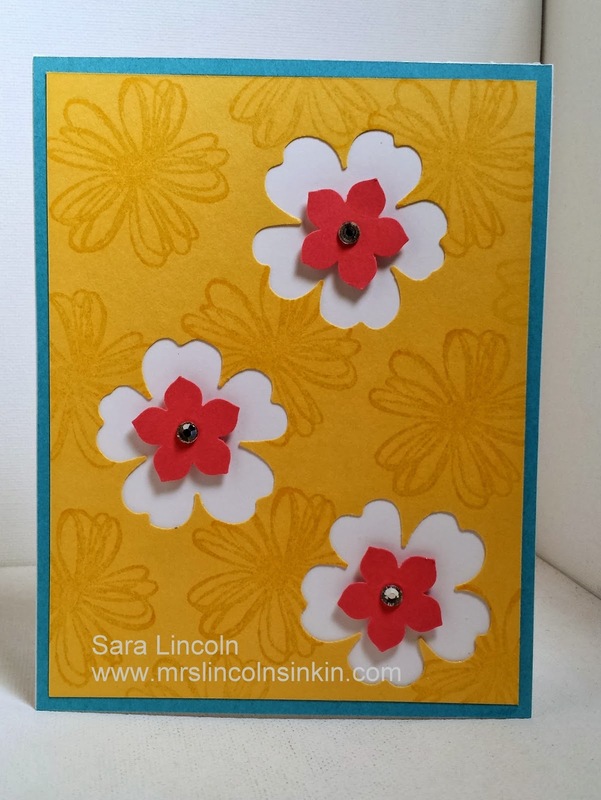 I decided to make my own DSP for this one using the Daffodil Delight and the Flower Shop stamp set. I used tone on tone with the Daffodil Delight and then took the Pansy Punch and punched out in 3 different places. I decided that i wanted some white to show so i used a piece of scrap Whisper White and placed it behind my Daffodil Delight. To add my Melon Mambo i couldn't help but use the Petite Petals Punch that is in the Occasions Mini right now. And that is it my friends. Pretty simple but i just LOVE these colors together! Makes me think of Summer and warm weather!!! So, what project am i featuring today? I thought i would share with you the Flower Shop stamp set as well as the Pansy Punch! I love sets that coordinate together and this one you can get in a clear or wood mount bundle. Click on the picture above to be taken directly to my on-line store where you can also see the details for the wood mount bundle.